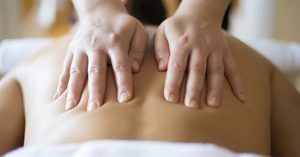 For those involved in an athletic or active exercise program; Massage can be a powerful tool to help you recover, reduce the chance of injury and even improve performance. After a workout or intense exercise your muscles can become tight, fatigued & constricted causing you aches and pains that can increase overtime and possibly lead to future injury. A frequent post workout massage will help prevent chronic pain, muscle tension and injury. Massage can also speed up post workout recovery time twice as fast as general rest. Massage increases circulation and improves blood flow to the tissue. This aids in reducing inflammation and decreasing “delayed onset muscle soreness” leaving you less sore after a workout. Why take a pain reliever when you could get a massage instead! A post workout massage can assist in restoring your original range of motion and improve flexibility allowing for more efficient workouts. This is important if you want to perform your exercises more efficiently and enhance your performance. Massage also relieves stress, promotes relaxation, & better sleep quality leaving you less fatigued. This gives you the extra energy you need for another day of physical activity. It is always best to work out before your massage. Working out after a massage is not a good idea as you are likely to stress and strain the muscles that were just relaxed. Frequency is the key as the benefits of massage are cumulative. A single massage session can’t totally work out all of your tension, aches & pains as we are constantly living and moving. It is best get a massage once a month or at least every six weeks.